Assassin’s Creed vs. Need for Speed: Which Has the Hype on Facebook? We’re rounding down the final weeks of console game release season. Today two greatly anticipated video games went on sale in the United States: Assassin’s Creed: Revelations from Electronic Arts and Need for Speed: The Run from Ubisoft. 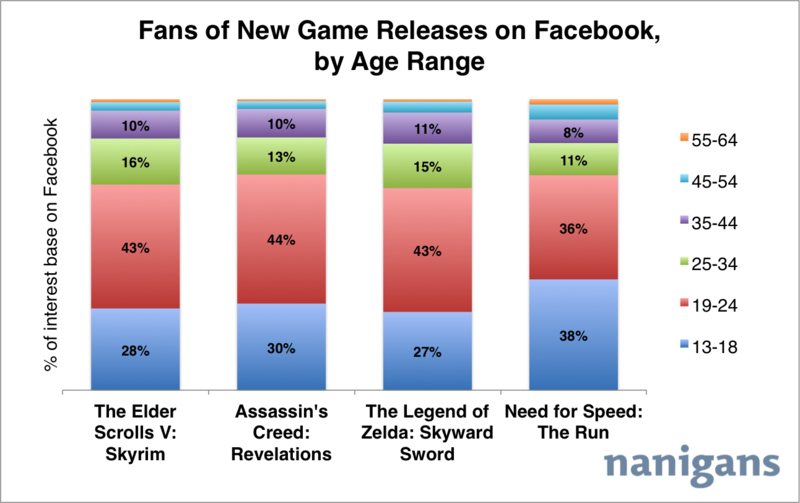 We were curious how the hype for these two games compared on Facebook, and expanded the analysis to also include The Elder Scrolls V: Skyrim from Bethesba (launched last Friday) and The Legend of Zelda: Skyward Sword from Nintendo (launches this Friday). While released on the same day, Assassin’s Creed: Revelations enjoys over six times the hype on Facebook than Need for Speed: The Run. The Elder Scrolls V: Skyrim has a considerably larger fan base on Facebook than both of the games released today, in part and no doubt due to the fact that the game has been on shelves and in players’ hands over the weekend. 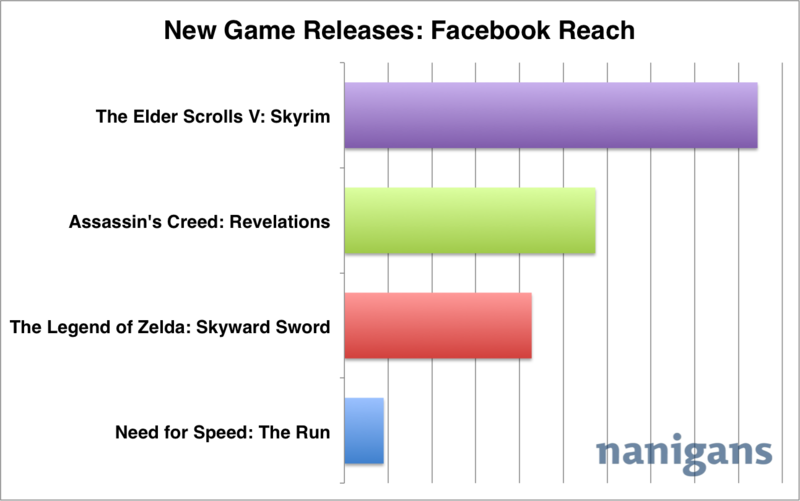 That being said, The Legend of Zelda: Skyward Sword has yet to launch and has over four times the hype on Facebook than Need for Speed: The Run. 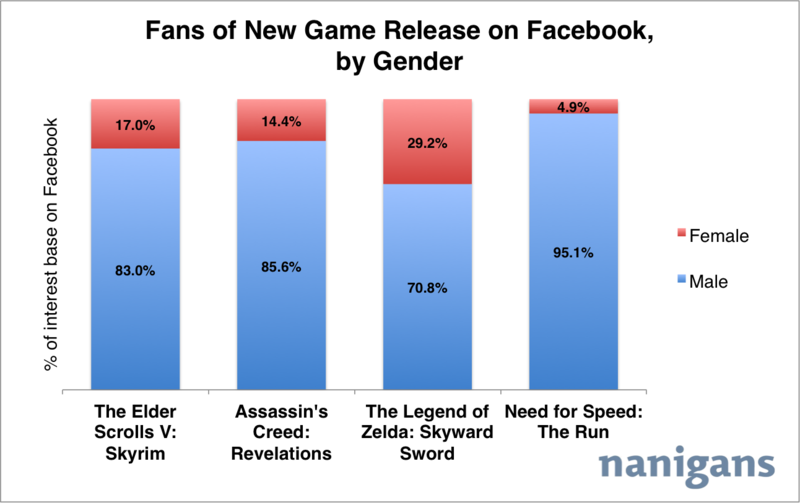 When it comes to the demographic profile of fans of these console games on Facebook, you would probably guess that more males than females are interested — and you would be right. Need for Speed: The Run takes the cake in having the smallest fraction of females interested in the game (5%), while The Legend of Zelda: Skyward Sword, on the other hand, has the largest fraction of females interested in the game. You might also guess that younger generations are more interested in these new console game releases than older generations — and you would also be correct. Need for Speed: The Run has the highest proportion of middle and high school students (ages 13-18) interested in the game. The other three newly released console games have slightly less interest from this age group, and instead enjoy a greater (and similar) interest base in college and those who just graduated (ages 19-24). 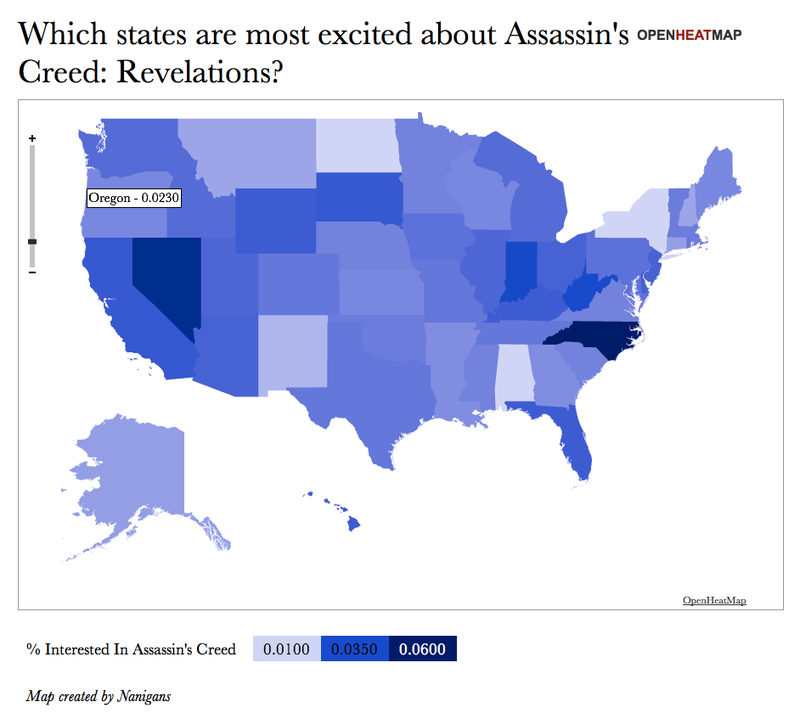 The state with by far the most concentrated excitement about Assassin Creed: Revelations on Facebook is North Carolina. Rounding out the top five also includes Nevada, Indiana, West Virginia and California. States with the least amount of interest in Assassin’s Creed: Revelations: North Dakota, New York, Alabama, New Mexico and Montana.